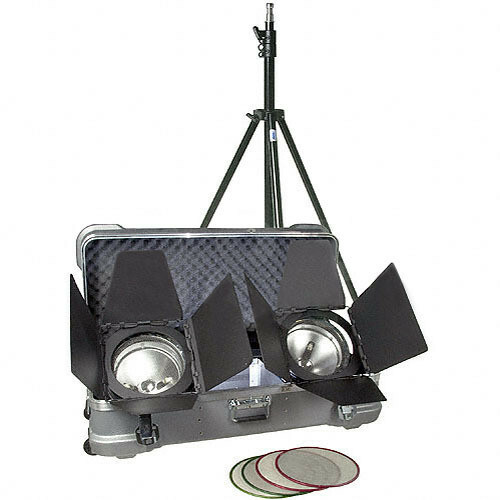 This is a complete ARRI ARRILITE 2000 Plus 2 Light Kit (220V) with barndoors, light stands, scrims, 120V bulbs, and a hard case. The ARRILITE 2000 Plus from ARRI is an enhanced version of the tried-and-true ARRILITE open face line. ARRI started with the basic design of the ARRILITE 2000 and optimized the reflector's efficiency to increase output substantially and smooth out the light distribution. The aluminum housing, while just as durable as its predecessor, is almost a pound lighter. The accessory holder handles scrims and barndoors while disc brake technology, which was so successful in the True Blue line, is employed here for extra holding power and stability even with weighty front accessories. Lamp change is quickly accomplished via a swing away front door and you don't have to worry about hot surfaces thanks to the heat-proof rear handle. Although this kit is supplied for use with 22V AC voltage, it can function with 220-240 voltage, with the appropriate optional bulbs, adapter plugs or cables. ARRIMAX reflector enables higher light efficiency and better light distribution. Aluminum housing enables heat dissipation. Heat-proof handle at rear of housing enables easy maneuvering. Thermoplastic housing weighs only 6.61 (3.0 kg). It's 14 oz (400g) lighter and has a more compact housing than the previous ARRILITE 2000 model. With appropriate bulb and plug adapter. Holds the ARRILITE 2000 Plus steady even with heavy accessories attached. Box Dimensions (LxWxH) 40.5 x 21.1 x 14.7"